Artist impression of the Olympia on Russell tower to be built in South Brisbane. 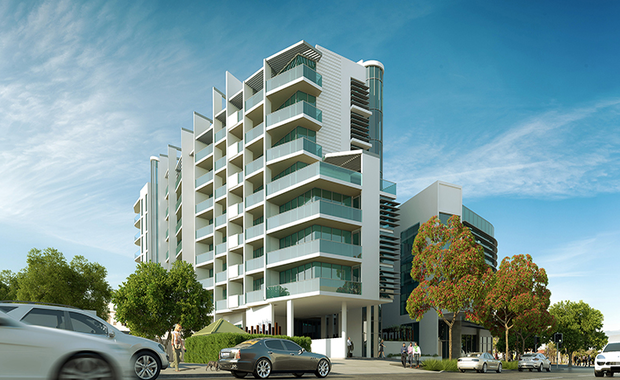 After an 18-month wait the Olympia on Russell apartment development in Brisbane's West End has officially been released to the market after receiving full developmental approval by the Brisbane City Council. As a joint venture by the Girdis Group and the Greek Orthodox Community of St George, South Brisbane, the development site is located on Russell Street comprising 65 residential apartments. Director of Place Projects Syd Walker said the inner-city apartment demand is continuing to drive Brisbane property, with Olympia on Russell already securing 42 contracts within the past week. "The market is in hot demand at the moment and we predicted strong interest from the start," Mr Walker said. "The extraordinary levels of interest achieved for the development shows the demand for a quality, boutique product located in the South Brisbane precinct. South Brisbane is home to all the economic and demographic drivers required to achieve long term capital growth, and we know that the rental demand for this new development is set to be unprecedented. "The Olympia development sits within Brisbane's inner-city precinct with prices for the apartments starting at just $380,000.